Hey, it’s me, Hero, again! I told you I’d be back. I’m really lucky too. I have my own novella, Hero’s Journey, out this month. Can you imagine how proud my mom is of me? My mom and I work together, you know. We are Sweet Pepper Fire Brigade rescue dogs – or at least we’re in training to be rescue dogs. It’s hard work, just like for the human firefighters in Sweet Pepper, Tennessee. We have Fire Chief Stella Griffin to help us. She’s the best! She’s kind and smart and knows everything about firefighting. The fire brigade needed her, and there she was, needing us too. Oh, and our other fire chief, Eric Gamlyn. Not everyone can see and hear him like I can. He knows a lot too. Stella says he’s been dead for longer than she’s been alive. Sometimes they argue, and the log cabin we share, shakes. But mostly they’re good together. I love eating Eric’s leftovers too. He’s a great cook! Stella is trying to find out what happened to Eric. Everyone thought he died in a silo fire forty years ago. Instead, it looks like someone killed him and hid his body. What an awful thing to happen to a real hero like Eric. So I do what I can to help. Everyone else does too. Stella says when something bad happens to one firefighter, it happens to all of us. That’s why we all have to pull together. Well, I’m late for practice. Stella says to wish everyone a Merry Christmas and a Happy New Year – and be careful where you put your candles. You don’t want to start a fire! 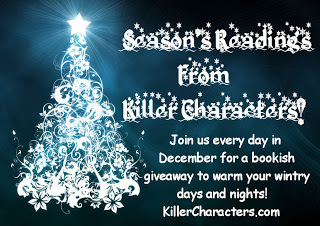 Stella, Eric, and Hero are giving away three books for the holiday. They will send the winner a print copy of That Old Flame of Mine and an E-copy of Hero’s Journey now, and a copy of their new print book, Playing with Fire, in January when it is released! To enter the contest, leave a comment. Another great series by Joyce and Jim. Such creative authors. Thanks for stopping by! Good luck in the contest! This looks to be a wonderful series that I'd love to read. I love to read. These books look like a interesting series. Please put me in the drawing. Thank you. Hero says thank you! Good luck in the contest! Looks like a great series that I'll have to give a try! Thanks for opportunity! Merry Christmas to all! Looks like another great series for me to try :) Happy Christmas! I read the first book of this series and enjoyed it a great deal. Looking forward to reading more. Happy Holidays. This sounds like a great series - from great authors! Merry Christmas! A mystery, a ghost AND dogs? Sounds like my kind of read. Thanks for stopping by, Booklady! Thanks for stopping by, Becky! This series is on my wish list. Hope you enjoy it, Nancy! Okay, I am not crazy. I know I just wrote a comment and hit publish... and nothing happened. This is the second time this week this comment section seems to have sent thoughts into the cyber ether. 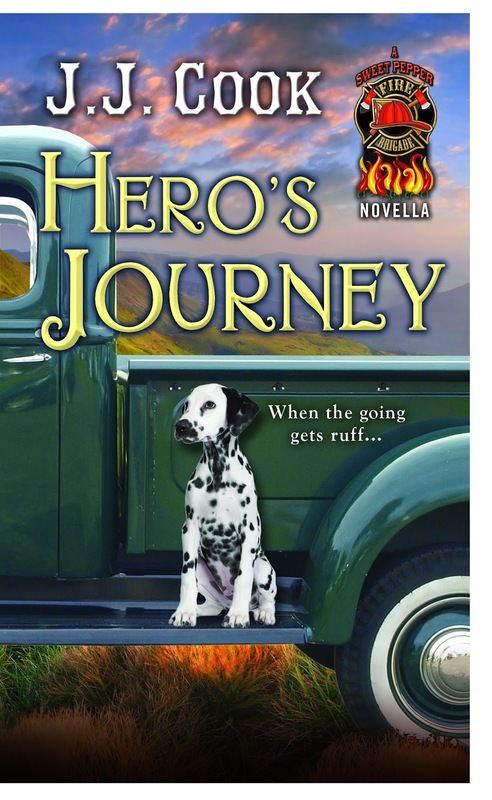 I loved Hero's Journey and am looking forward to reading the next adventure of Hero and the Sweet Pepper crew. The characters and storyline are interesting and fun. Joyce, you and Jim are a fantastic duo when it comes to all the wonderful books you've written. I own an assortment of them and they sit proudly on my overcrowded book cases (photos available on my FB page). Thank you, Nora! We appreciate you stopping by! 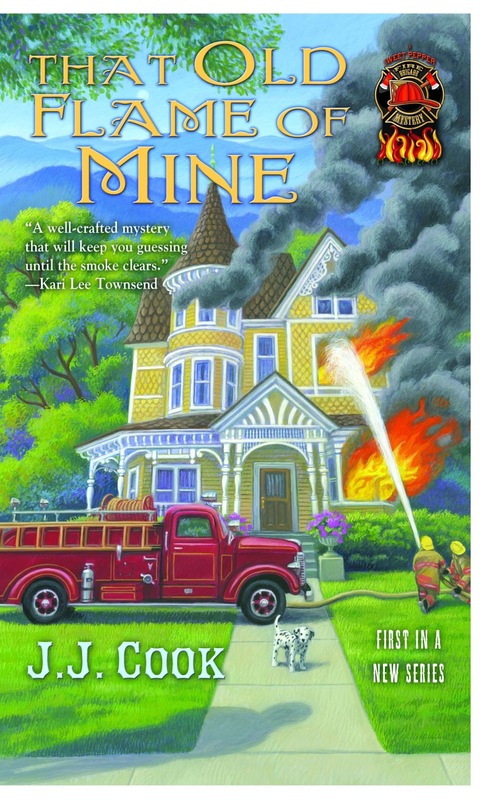 I really, really liked "That Old Flame of Mine"! Eric is such a nice ghost! I would like to read more about Stella, Eric and Hero. This is on my TBR list and I would love to win! Live near a fire station and Chicago Fire is one of my favorite TV shows, so I will have to add this series to my TBR pile. Oh, I have been waiting for these book. I really enjoyed getting to know Stella and Eric and have been waiting to see how things are going in Sweet Pepper! I'd love to win! These are going on my TBR shelf right now! I would love read this series! Fingers crossed. Delightful little fellow. I'd love to get to know him better. I have been wanting to try this series. I love the premise and the covers. I've liked your other series as well. Love the new series !! I"m getting my library customers excited about it too ! I loved the first book in this series. Another series for me to try.....and, I'm sure, love! Hero has to be a great fellow, and I can't wait to meet him! Hero, I'd love to meet you and hear about your journey. I LOVE this series. I think a firefighting series is different and original. 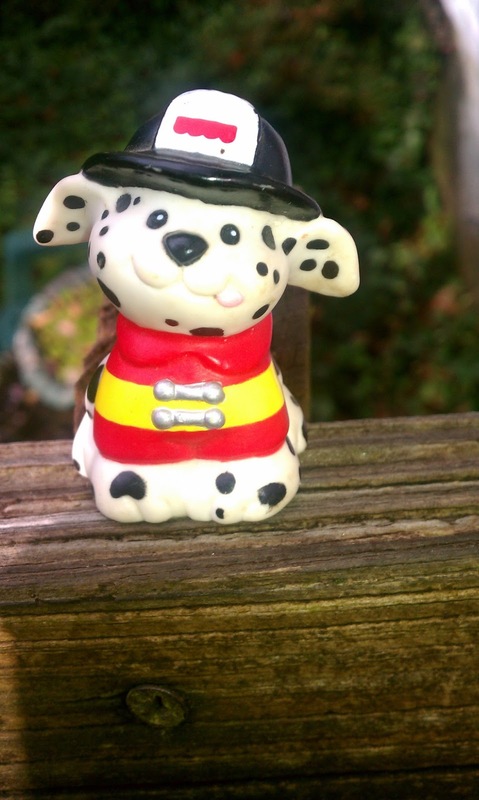 I like the firehouse Dalmation. Hero is an appropriate name for him. I like ghosts in cozies. There's a lot of them now. Unfortunately, sometimes there are candle fires. Once in a while you hear about a local fire that started from a candle and usually there are lots of deaths involved, including kids. They don't write an article in the paper about it if only one person is killed. That is sad but true about individuals killed in fires, Michelle. This looks like a terrific group of books. Would love to read them. Hero, you are just so cute---and not even afraid of that ghost. Love these stories and would love to win. Hero likes you too, Sue! Am I sensing a theme here today or it is just hot all of a sudden? Always on the look out for a new mystery series to read, and this series seem to fit the bill perfectly, so I hope I will win them! Thanks for stopping by, Martin! I tweet @authorjlavene - and frequently tweet the news. Follow me and I'll follow you! Thanks! Thanks for stopping by, Rosalee! Wow, a three-for! Everyone needs a hero! I loved the first book, I bought it as an e-book and decided I needed to get a hard copy. LOL. Love this series! I would love to dive into a new mystery series and this sounds delightful. Love hearing the dog's point of view. I've lived with guide dogs for the past 30 years and admire working animals and what they know, do, and teach us. Looking forward to reading these. We admire them too, Claire! Thanks for stopping by! 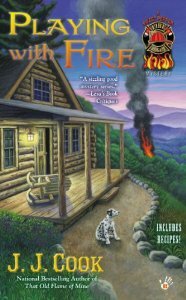 This story takes place in a small town named Sweet Pepper, with Stella Griffin standing in as the Fire Chief. There is a Ghost of an old murdered Fire Chief named Eric living in her cabin .... and Hero. Hero is the Volunteer Fire Brigade’s mascot Dalmatian Puppy. Light mystery and a Quick read. AND can be read as a stand alone book, though You’d certainly want to read the prior book too. I really enjoyed the characters, the setting, and the story line. I couldn't put it down! I wanted to know what happened to Hero! I couldn't figure out “who did it“ or what happened to him till the end.. I can‘t wait to start the next book in the series. This series is certainly a page turner.